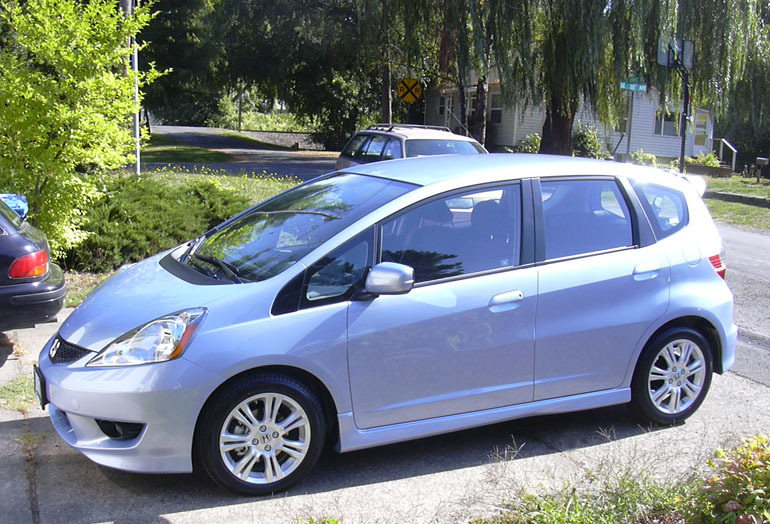 It's a 2009 Honda Fit, which means that it's a CAR FROM THE FUTURE! I actually bought it two weeks ago, but it didn't arrive at the dealer until yesterday. It's got some sweet features, like real-time fuel consumption metrics, tire pressure monitor, oil viscosity monitor, engine immobilizer and bonus audio inputs: MP3 and USB. Best of all, the dashboard has large areas suitable for Mr. Bobblehead Moose, so he doesn't have to be regulated to the tray by the stickshift. Well, actually BEST of all is that the new car doesn't have the rattles, squeaks, broken parts, and Killer-Attack Seat Belts of the old Evanmobile. In Other News: You may have heard that I fell ill last weekend, and missed the planned outing to the Portland Pirate Festival (I know! There were cannons!) with thrihyrne, much to my disappointment. I felt well enough to work, but it took until Thursday for the lingering symptoms to go away. My hope is that was my cold for this winter, and I got it over with early. Yesterday I took the day off from BHFT. There was a doctor appointment in the morning (everything's fine), then went to Pappaccino's for a highly-enjoyable chat with leboyfriend. Then off to the library for a couple hours of looking up publishers in the Writer's Market book. It made me feel all Serious Writer-ish. I found about a dozen interesting prospects and a couple dozen less-interesting prospects. I'll do some more research on websites, and come up with a priority list for queries. The bigger houses want agented manuscripts, so I gathered a few listings from the Agents section (not many list "Humor" in their areas of interest). It's a little anxiety-provoking to see some publishers say they publish two years after acceptance. Fortunately, most have a much shorter turn-around time. Monday, I start working a new schedule at BHFT: 4 10-hour days/week. I'd asked about a 32-hour schedule, but despite their 20% savings, the Client didn't want to lose 20% of my time. So I said I'd try the longer days. On the Plus Side: I intend to use the extra day off each week to advance my creative projects. The downside is that I may not have much interest or energy in writing or webcomicry during the evenings of those four work days. Will pushing all my creative time into the long weekend be productive? Will I finally stumble, and fail to post a comic on a scheduled day? Stay tuned, and we'll find out!